Early services with diner to follow. Hundreds of synagogues across the continent will take part in an historic national Jewish event to celebrate what unifies all Jews — Shabbat! Everyone is invited… singles, couples, families — all ages. That’s the magic of Shabbat Across America and Shabbat Across Canada. By participating in this continent-wide event, you will not only have the opportunity to experience Shabbat, but you will be sharing your experience with tens of thousands of Jews across North America. No matter what your affiliation or which Shabbat Across America or Shabbat Across Canada location you choose to attend, NJOP’s annual Shabbat program will give you a “taste” of Shabbat. Explanatory services, traditional rituals, delicious meals and lively discussions are all important components of the Shabbat experience, as well as the opportunity to spend the evening with like-minded people, friends and family. 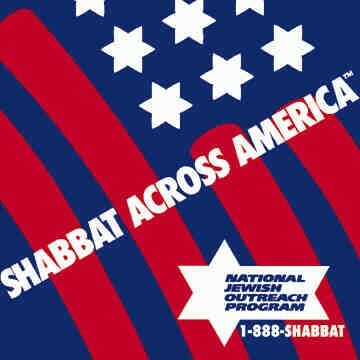 Shabbat Across America or Shabbat Across Canada is for every Jew, and those who are unable to go to a registered location can participate in their own homes or in gatherings with friends/family.